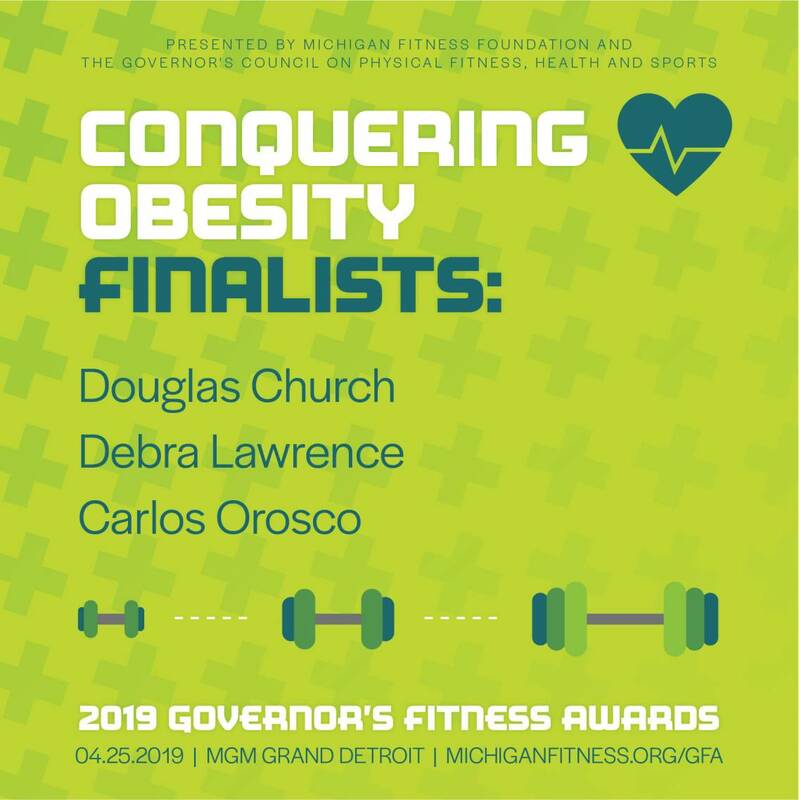 One finalist in each category will receive the Governor's Fitness award, and they will be recognized during the gala celebration at MGM Grand Detroit April. LANSING, Mich. - March 15, 2019 - PRLog -- Michigan Fitness Foundation announced the selection of finalists for the 2019 Governor's Fitness Awards (GFA) Conquering Obesity award. "The Conquering Obesity Award recognizes individuals who have made a meaningful commitment to overcome health issues through nutrition and physical activity and have inspired others to make intentional changes to improve their health," shares Amy Ghannam, President and CEO of Michigan Fitness Foundation. "By recognizing and sharing their extraordinary stories, they influence us all to have a renewed vigor to make healthier choices. We invite citizens from across to state to join us at the MGM Grand on April 25 as we celebrate this year's GFA finalists." Michigan Fitness Foundation and the Governor's Council on Physical Fitness, Health and Sports present the annual Governor's Fitness Awards to honor individuals, organizations, and communities that inspire health, wellness and active living. The winners of all the Governor's Fitness Awards will be announced at Gala Celebration on the evening of Thursday April 25, 2019 5:30 – 8:30 pm at the MGM Grand Detroit. For more information and tickets, visit: http://www.michiganfitness.org/gfa. Governor's Fitness Awards categories include: Director's Champion for Health, Conquering Obesity, Charles T. Kuntzleman Accepting the Challenge, Extraordinary Event or Organization, Healthy Workplace, and Active Community Awards.